Measure, mark, and make all of the cuts on the cut list according to the cut diagram. Use a circular saw to cut the two 8” legs from one 36” x 2” x 2” Wood Square End Baluster and the 3.75” Wheel Axle from the 1/2” x 48” Wood Round Dowel. For the 7” Wheel, make a mark in the center of the 2” x 8” x 8’ board about 6” in from the end of the board. Screw one screw halfway into the center mark and wrap a string with one end tied around the screw head and the other end tied around a pencil with 3-1/2” of string between the nail and the pencil and draw the 7” circle. Use a ½” drill bit to drill a hole touching the line of the circle on the outside of the line and then insert a jigsaw into the hole to finish cutting along the outline of the circle. OPTIONAL: Smooth any rough ends with sandpaper or sander. Measure and mark the center of both remaining 36” x 2” x 2” Wood Square End Balusters at 1-1/4” from the ends. Using the ½” drill bit, drill a 1/2” hole halfway through the baluster at the center mark of each of the balusters using a slight 5° angle and the drill bit pointing away from short end of the baluster. See diagram. Drill a 1/2" hole through the center mark of the 7" Wheel. Turn Large Wood Crate upside and align one of the Balusters over the bottom of the crate so that the end of the Baluster with the drilled hole overhangs the end of the crate by 6” and is centered over the second slat on that side while the other end of the Baluster is angled to hit in between the two outermost slats on the other end of the crate, allowing a 12” overhang on that side to act as a handle. Secure Baluster to the bottom of crate using a 2-1/2” screw on each end. Insert the 3.75” Wheel Axle into the drilled hole on the secured Baluster, slide 7” Wheel onto Wheel Axle, and insert Wheel Axle into the remaining Baluster. With the wheel sandwiched securely between the two Balusters, secure the remaining Baluster to the bottom of the crate centered over the second slat at the wheel end and between the two outermost slats at the handle end using 2-1/2” screws at each end. Place the two 8” Legs vertically 3/4” in from the end of the crate on the outside of the Balusters. Secure with one 2-1/2” screw through the Balusters. 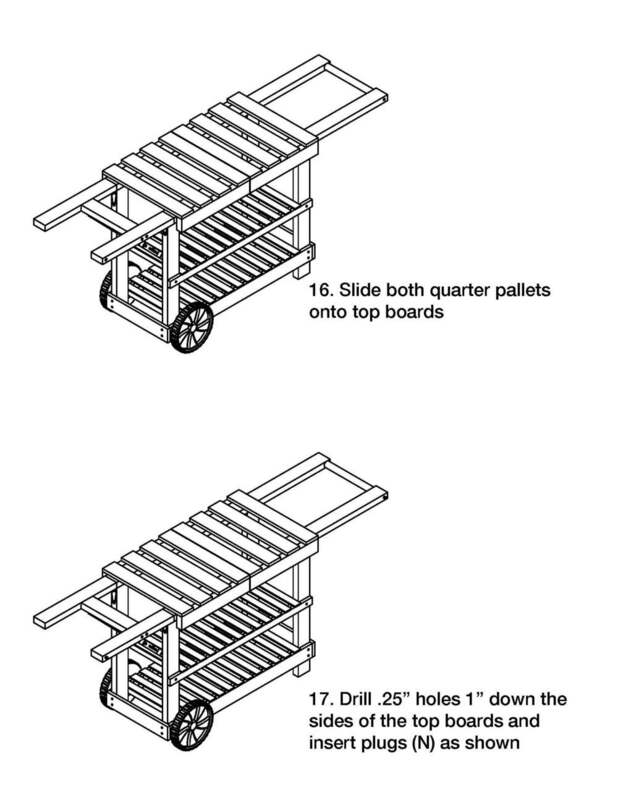 Turn Wheelbarrow over and secure the legs through the slat on the inside bottom of the crate using one 1” screw into each leg. Paint or Stain and Finish (optional): Paint or stain and polyurethane especially if using outside. Total cost without optional wood glue is $51.66; with wood glue is $54.63. These are based on market pricing in Atlanta, GA and do not include tax. The short and sweet version: Measure, mark and cut the two boards according to the cut diagram. TIP: From the 1”x 12”x 8’ board, it’s easiest to cut out the top and bottom boards prior to cutting the support piece. 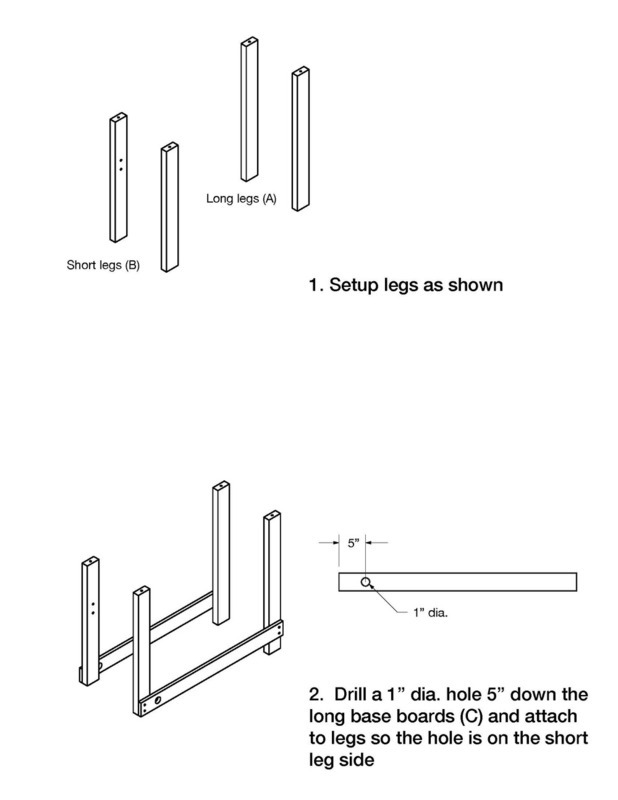 The longer version: Step 1: On the 1”x 4”x 6’ board, measure and mark 4 sections of the board at 17.25” each for the legs (see diagram). Set aside. Step 2: On the 1” x 12” x 8’ board, measure and mark one section of the board at 37.5” x 11.5” for the top board, one section at 36” x 11.5” for the bottom board, and one piece at 9.5” x 4” for the support (see diagram). Step 3: Use a circular saw to make the cuts at the measured marks for the 4 legs, top board, bottom board, and support piece. TIP: It’s easiest to cut out the top and bottom boards prior to cutting the support piece. Pre-drill two holes at the 18” center of the bottom board, one 3” from the edge and the next one 3” from the first. Use a bead of wood glue (optional) along the 9.5”L edge of the support piece and align pre-drilled holes in the bottom board on top of the support piece, ensuring that the end of the support piece is flush with the edge of the bottom board. 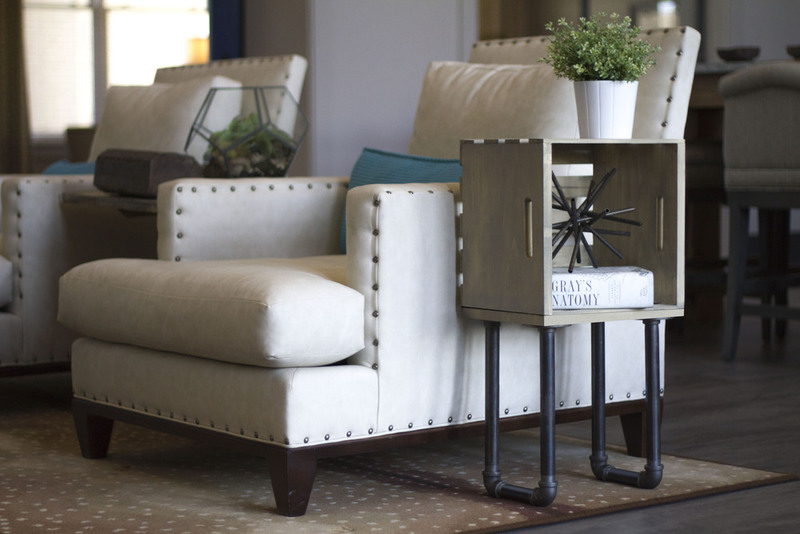 TIP: Push the 2” wood screws through the pre-drilled holes, align the 9.5”L edge of the support piece flush with the edge of the bottom board and centered over the two screws, and push the support piece down onto the screws to make an indention mark into the support piece. Drill a ¼” deep starter hole in the support piece where the indention marks are to help as guides when installing the support piece beneath the bottom board. Drill 2” wood screws through the pre-drilled holes in the bottom board and into the support piece aligned below. TIP: Pre-drilling holes in the crate slats will help keep the wood slats from splitting. 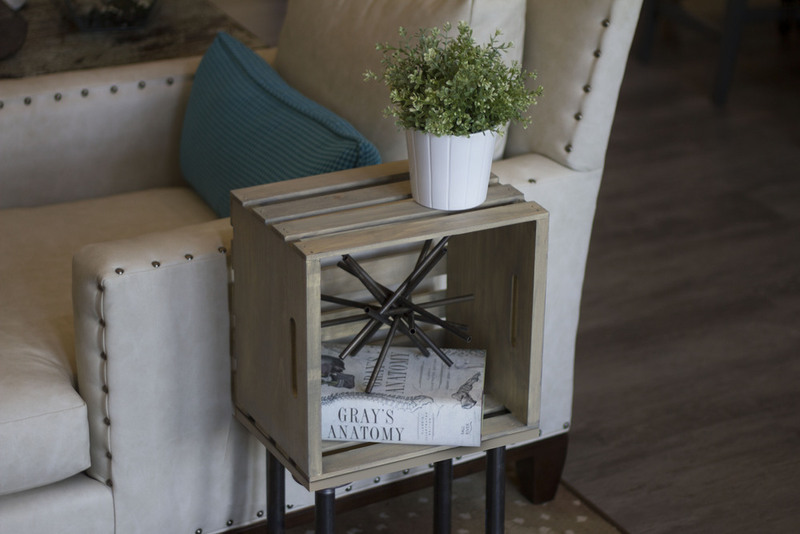 Turn the two large crates slat side down and attach them side by side in the center using 1 ¼” wood screws in each of the four corners. Align back of crates with the edge of the bottom board and use a ¾” wood screw in the bottom corners of each crate to attach the crates to the bottom board. Attach legs to the outside of the bench ends with 1-1/4” wood screws in each of the inside crate corners. Use two legs on each side of the bench and ensure legs are flush with the left and right edges of the crate ends. Place top board on top of crates and attach from inside of the crate using ¾” wood screws in each corner. This easy DIY wine bottle crate holds up to 12 bottles of wine, making it the perfect gift for the wine lover on your list. By making a few simple cuts in a piece of 3/16” plywood using the Ryobi One+ circular saw, jigsaw, and sander tools, and inserting the cut panels into a Crates and Pallet Large Wooden Crate from homedepot.com, the wine bottle crate will be ready for a bow and under the tree in about 45 minutes. Leave it unfinished or dress it up with paint or stain, and add a bottle or two of their favorite vintage for a personal gift that will be sure to please. Note: Templates have been provided for steps 1-4 as a shortcut. The templates will need to be printed on 11" x 17" paper for the correct scale. Step 1: Cutting along the wood grain of the 3/16” plywood, use the Ryobi One+ circular saw to cut two rectangles measuring 16-1/2”W x 9-1/4”H. Set aside. Step 2: Continuing to cut along the wood grain, use the Ryobi One+ circular saw to cut three more rectangles from the 3/16” plywood measuring 11-7/8”W x 9-1/4”H. Step 3: Using the two larger rectangles from Step 1 and measuring along the longest side, from the shorter edge, measure over 3-15/16” and make a mark. From there, measure 4-3/4” vertically and draw a straight line up. From there, measure over 1/4" and draw a horizontal line. Then draw a straight line back down to the edge of the panel. Draw two more inserts each 3-15/16” apart. Draw the 3 inserts on both of the longer panels and cut the 3 inserts out of each panel using a Ryobi One+ jigsaw. Sanding with the grain, use the Ryobi One+ sander to smooth any edges or splintering caused by the saw cuts. Step 4: Using the three smaller rectangles from Step 2 and measuring along the longest side, from the shorter edge, measure over 3-15/16” and make a mark. From there, measure 4-3/4” vertically and draw a straight line up. From there, measure over 1/4" and draw a horizontal line. Then draw a straight line back down to the edge of the panel. Draw one more insert 3-15/16” apart from the first. Draw the 2 inserts on all 3 of the shorter panels and cut the 2 inserts out of each panel using a Ryobi One+ jigsaw. Sanding with the grain, use the Ryobi One+ sander to smooth any edges or splintering caused by the saw cuts. Step 5: Interlock the two larger rectangles with the three smaller rectangles where the inserts were cut in order to form a grid design. Step 6: Push the entire interlocking grid inside of the Crates and Pallet Large Wooden Crate. 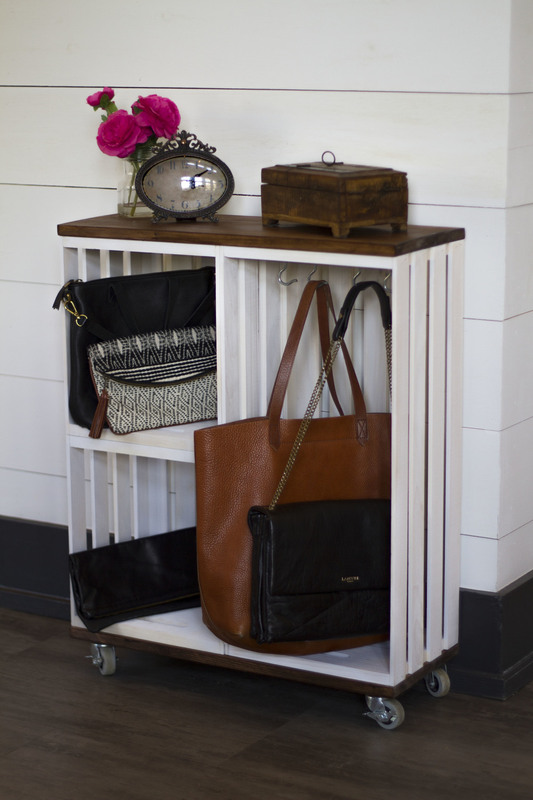 Step 7: (Optional): Paint or stain the wine bottle crate for a customized look. The pictured wine bottle crate was stained with Verathane Wood Stain in Kona and then coated with Verathane Polyurethane in clear satin. Paint the stain on and then immediately wipe off with a sponge. Let stain dry and finish with a coat of the clear satin polyurethane. STEP 1: Cut the 2 side boards as shown. STEP 2: Mount the first crate 4" inches down one side board so that the bottom of the crate and ground are parallel. STEP 3: Mount the remaining crates to the side, and then mount the other side board to the crates. STEP 4: Finally, attach the top board by screwing through the top board at an angle into the side boards.